Apple's retail "experts" —a new position that will serve as a roaming counterpart to existing "geniuses" at brick-and-mortar locations —are expected to debut in stores in a matter of weeks, people familiar with the matter have told AppleInsider. Interviewing for the expert position is said to start this week at the company's retail outlets, and Apple plans to debut the new personnel in about two weeks. 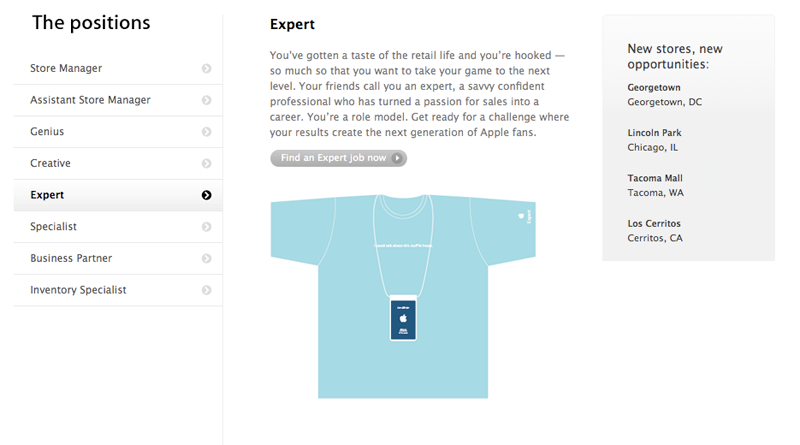 Originally, the "expert" title was only available to current Apple Store employees who sought a promotion within the company. Apple has referred to the experts as "Family Room expertise out in the Red Zone." The "Family Room" at an Apple Store is known to customers as the Genius Bar. The "Red Zone" equates to the sales floor. "You've gotten a taste of the retail life and you're hooked - so much so that you want to take your game to the next level," Apple's Web site says of the expert position. "Your friends call you an expert, a savvy confident professional who has turned a passion for sales into a career. Youre a role model. Get ready for a challenge where your results create the next generation of Apple fans." As noted last month by Gary Allen at ifoAppleStore, Apple has begun advertising for the new expert position at all of its retail locations. The company reportedly plans to have at least three experts at each store, with more staffed at its larger locations. Experts will serve as a resource that answers questions for customers without an appointment. They will have a general knowledge of the whole product range. The experts could be one of many changes coming to Apple's retail stores in the future. The company plans to build a "prototype" store in Palo Alto, Calif., just 20 minutes from its campus in Cupertino. The new design will have an entirely transparent building at ground level with trees growing inside. Skylights above would allow for natural lighting. Last year, the company's senior vice president of Retail, Ron Johnson, said Apple recently realized their stores are too small. All future locations are now planned to be at least three tables wide. The Mac maker also plans to have more "significant stores" that attract attention, like its flagship Fifth Ave. location in New York City. Apple plans to accelerate and open more stores this year, with 50 new locations set to debut in 2010. Apple stores are estimated to have sold more than $6.6 billion in products during 2009.